It’s a good time to get stuck into the blog folks, driven out of my breakfast cafe – Ba Ba Black – by the two surgeons at the next table comparing stomach surgery tequniques – including ‘pinholes opening in membranes’ and the tendency of certain muscles in the area to want to ‘squirt liquids’! Not good first thing in the morning! But Ba Ba Black deserve a mention. They’ve looked after me and the local sales team with coffee, breakfast and lunch on previous trips, and they are doing exactly the same this time. I especially like the fact that they’re probably the only hole in the wall cafe in Australia lit up by a single – very tasteful, thanks – chandelier. The muffins are baked in house each morning, and they give away the leftovers at 2pm every day as they close at 3 – and they like whatever they’re serving up to be fresh. What a top old school approach. You can see why we get on well. I dropped in some Haighs chocolates (from Adelaide) for the team this morning – best choc in Australia for my money – because that’s a nice way to start any day! Yesterday I had their lunch special – homemade moussaka pot with salad at $10 – yum on a drizzly old Perth afternoon. I’ll put some photos in for you this afternoon. If you’re over in East Perth – drop in, it’s a good spot for coffee, to relax, and to brush up on your abdominal surgery information! Now to catch up our Rare & Fine Dinner from Tuesday night across town in West Perth at Perugino’s. Come on in to the traditional white linen world of Francesco ‘Frenchy’ Pagliaricci – very able bodied front of house maitre d’ for the family operation opened by mum and dad Rosalba and Guiseppe in 1986. Guiseppe is still up to his elbows running everything in the kitchen, but finds time to come out and chat to diners when the heat’s off. We had a lovely degustation-style dinner with dishes matched to single wines, and I got so caught up in answering questions at tables that I completely forgot to get photos of everything. So here’s what I did get. With the 2008 Yalumba FDW 7C Adelaide Hills Chardonnay – which, by the way folks, is fast winning people back to the Chardy Revival – was this really simple but flavour fab ‘Gamberi Ubriachi’. 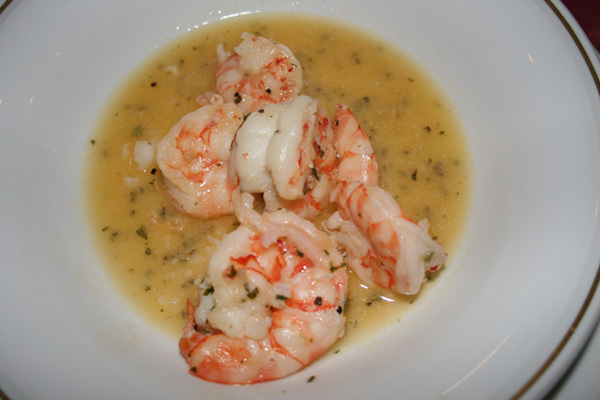 That’s ‘West Australian Tiger Prawns tossed with the Chardonnay, herbs and butter’ in English. Yes that’s correct … butter. Salted butter – the X factor that we love, and the reason why I only ate two of those lovely things in that bowl! But the fresh acid of the FDW 7C cut through the sauce and cleaned up nicely, leaving just that hint of garlic and herb behind after polishing off those succulent Tiger Prawn crescents. 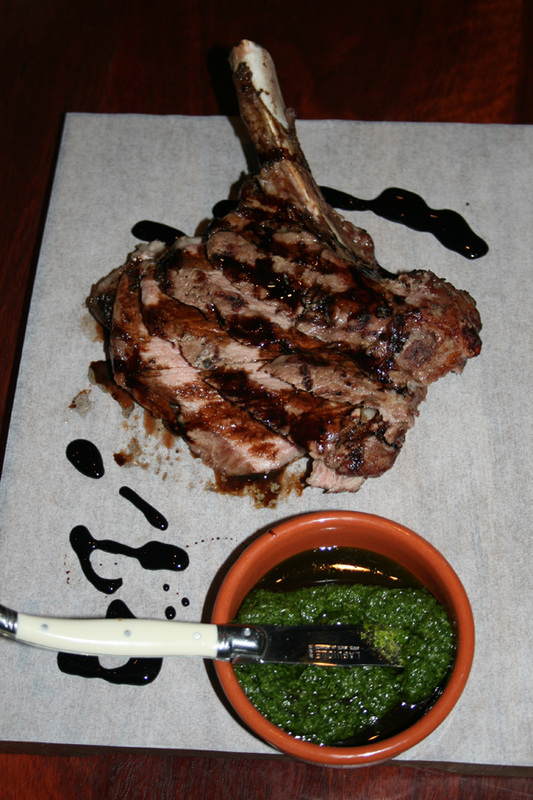 The other combo is the natural overlap between lamb and our 2006 The Signature Cabernet Shiraz. The big solid layer cake of fruit and elegant oak was spot on with the slightly fatty-in-a-nice-way racklets of lamb done almost ‘french crumbed cutlet’ style. 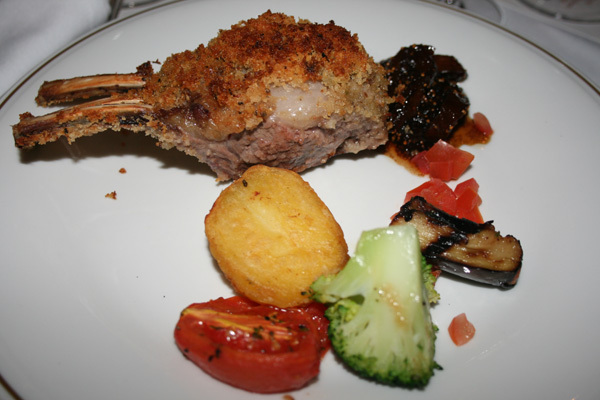 This is Guiseppe’s ‘Carre D’Agnello Con Fichi’ or ‘Rack of lamb crusted and served with caramelized figs’. Oh yes – figs reduced almost to relish with the spice and fruit jumping out of The Signature – tick that box. And for the record folks, Frenchy’s coffee is worth the trip to West Perth on its own. He’s a very tidy parcel of black-tie, ‘The Godfather’-suited, old-style Italian charm this lad, and we love being on his wine list. Thanks for a great night out. It was my first meal at Perugino’s and definitely won’t be my last. I’d best get organised now, as I’m out in the trade today with Pia – our gal that looks after restaurants around Perth – and then off to The South Perth Yacht Club for their Yalumba dinner tonight. The plastic will be coming off the dry-cleaned Sarah Palin lookalike twinset tonight people – anything could happen! 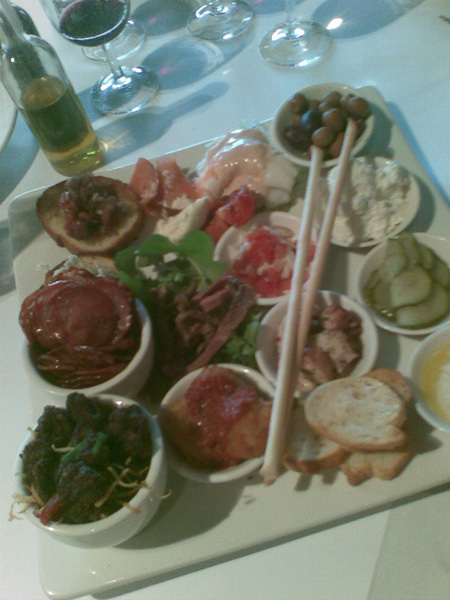 Vermentino and antipasto in Perth, anyone? 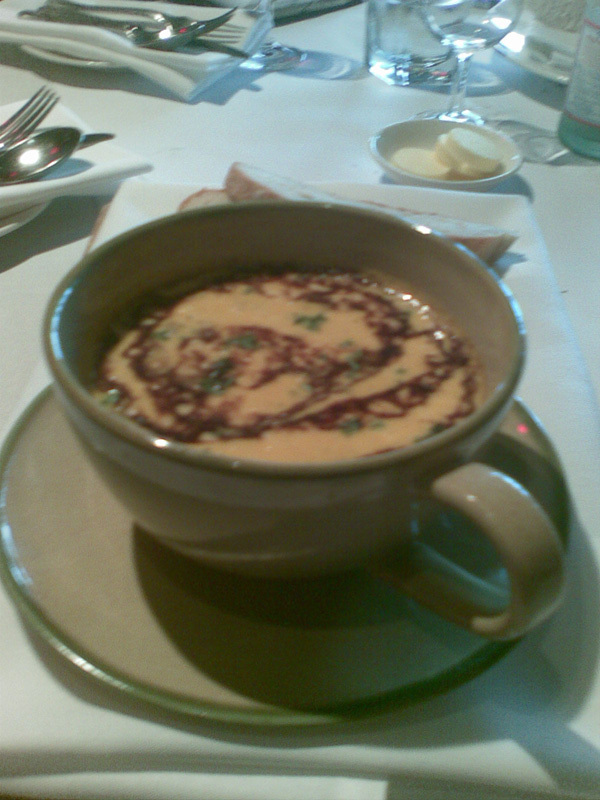 Just for the record, I had the pumpkin, coconut & coriander soup! If you’re in Perth, and in search of the unforgettably unique beef meal, try the Old Brewery’s ‘Tomahawk’ Steaks on for size! 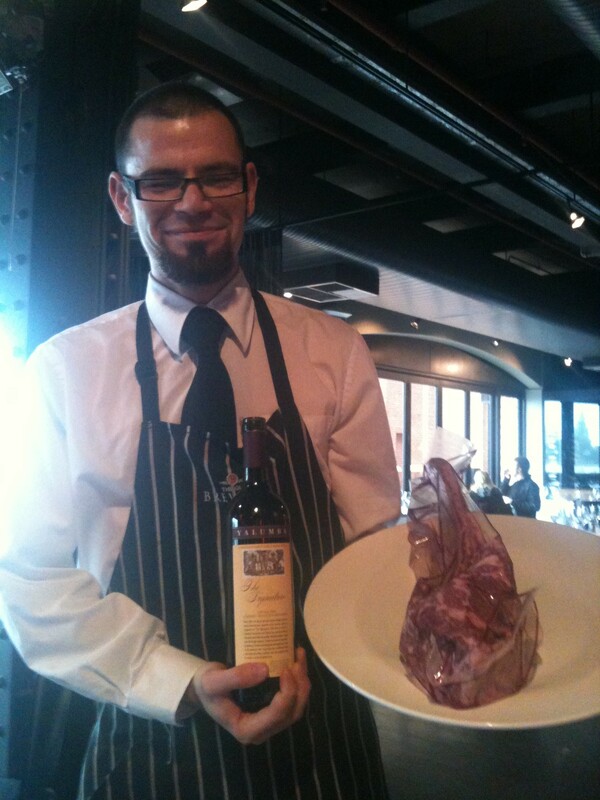 They’re 400+ day grain fed Margaret River Waygu beef – on the bone – from 1.3 – 2.7kg … each! They work out to $13.70 per 100 grams, but if you’ve ever secretly wanted your own Fred Flintstone cave man meat moment – this is the one! And beef on the bone – would love either the FDR1A or The Signature – no risk! ‘Sardine – toasted ciabatta, tomatoes, Italian sardines, shallots, chilli & extra virgin oil’ or ‘Arancini – blue swimmer crab, preserved lemon, spring onion & basil infused mayonnaise’ or even ‘Cappesante – seared scallops, potato saffron puree, crisp pancetta & orange vincotto’. Black, Blue & Green Skies in The West! It’s a wild and windy old start to the day over here in Perth. There’s a storm warning out. The temperature outside is plumetting – I know because I just ventured next door to Baa Baa the brekky spot for a coffee – and the sky looks badly black, blue and bright green bruised – like it just took a big punch from Joel ‘2 Guns’ Casey. (The pride of Townsville is ranked 3rd in the Light Heavyweight division by the Australian National Boxing Federation. Check the blog from May 22nd “You’ll never guess what I saw in Townsville last night”.) I’ll have to get this post done in a hurry, as the boys at the cafe reckon we’ll lose power with the gale force winds and squalls predicted. Thank goodness I flew in yesterday! Now let’s get to where we were last night. We kicked off our “Yalumba Visits Perth” Week with a Rare & Fine masterclass at Your Shout Liquor in Mt Lawley. Neil runs Your Shout and has decorated the shop in a style that I’d call ‘retro eccentric’, but I really like it – right down to the bright blue pin lights in the grapevine up on the wall, the ’70s filament lights, and of course the Elvis clock. He also has a severely staunch consumer wine club, and they do a great program of regular tastings with visiting and local winemakers. And when you do a tasting here, it’s not just a quick run-through of aroma and palate dissection – you need to get into a bit of depth because these palates are enquiring as a group! The other top thing about tastings here is that Neil puts together antipasto platters with savoury, cheese, sweet and fruit flavours – so you really get to properly showcase the wines that you put on. Here’s what I mean – the local Italian deli meat plate with salamis, pepperoni, mortadella and ham – and the antipasto combo. 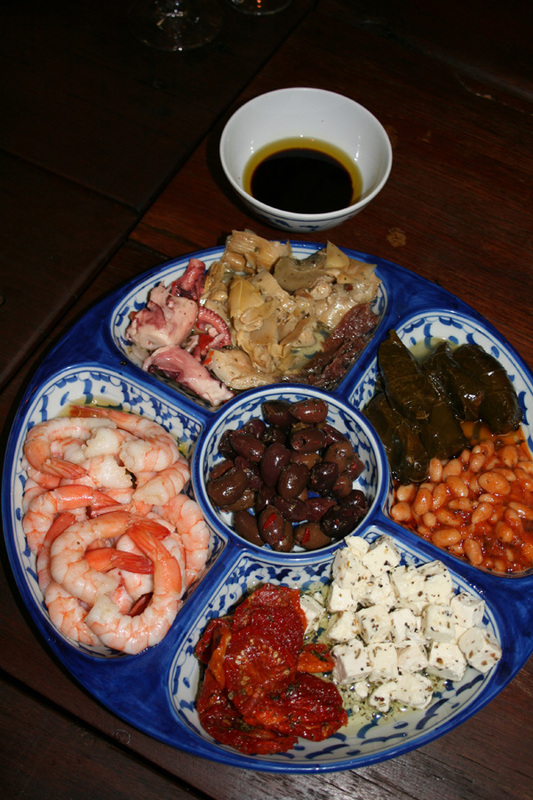 From the top – local olive oil and balsamic vinegar with – going clockwise – pickled octopus & artichokes, dolmades & chilli soybeans, marinated fetta & semi dried tomatoes, freshly shelled prawns, with chilli olives in the middle. 2009 Yalumba FSW8B Botrytis Viognier. This lineup really gave folks an interesting insight into our Yalumba wine world, with the regions of the Barossa, Adelaide Hills, Eden Valley, Coonawarra and Wrattonbully represented. It also crossed into in-depth Cabernet Shiraz blend country, and with the 2002 The Reserve teetering right on the transition from primary fruit to secondary development tobacco – it’s a treat to show how the great Australian traditional blend ages. These days, 2002 is a serious back vintage! Also noted is The 2006 Octavius moving a little quicker at present than The 2006 Signature, with the Shiraz showing not only fruit lift volume on the nose, but real density and length on the palate. And for the finishing sweet flourish – nice to see the surprise and delight on the faces of the tasters as they tried the 2009 FSW8B Botrytis Viognier from Wrattonbully. We scored a few converts last night to sweet wines, as they don’t need to be gluggy and cloying. And it takes a pretty bouncy memorable sticky to follow those three Cabernet Shiraz wines and The Octavius. The storm has just hit, the lights are flickering, and the rain is belting in horizontally on the glass! I’m going to finish right now so I don’t lose this. Thanks Neil and all the folks in the Your Shout wine tasting brigade for having us back – special mention to a couple of my favourites the personal trainers who look after the Navy here – Nick & Lawrie. And thanks to Byron – one of our men who look after Yalumba here in Perth for making it all happen … and we’ll see you same time next year when we do a dinner for you all at one of Neil’s favourite restaurants. That will be one big memorable late night out – don’t miss it ! What a lovely ‘welcome to town’ folks – even if Jacki and I will be trying to run around today and tonight in the teeth of a gale! Morning folks, and I have a ‘no ash cloud to be seen’ kind of clear blue sky day here in Adelaide, and 23C waiting for me in Perth! I gave myself heaps of time to get down to the airport from The Barossa today as it’s almost as if, after I get off The Northern Expressway (my favourite piece of bitumen – lovely run home thanks! ), the whole place is like a giant meccano set! But the good thing about getting to the Adelaide Airport early is that there’s a Cibo in the terminal so good coffee and their magic must-do toasties with ham, cheese and mushrooms – I think they’re called Piadinas – are the easy way to soak up the time until boarding. So this week we’re taking the Rare & Fines across to the Big Wide Open West bit of the country, we’ve got some really nice events lined up, and if all goes well in the glass – we’ll win a few more hearts and palates whilst we’re there! Wish us luck, and I’ll let you know how we go. Morning folks – and it’s a ‘get your washing out on the line’ day again up here in The Barossa. Everyone is out pruning at a rate of knots, making the best of the clear days. I’ll try to post a ‘before’ and ‘after’ photo of some spur-pruned old vines so you can see what goes on – they’re down on the Valley floor behind Tanunda on Magnolia Road. I’ll be madly ironing stuff and throwing it into the suitcase this afternoon, as it looks like the volcanic ash cloud is going to cooperate, and we’ll still be flying to Perth tomorrow. Just before I get into all that domestic stuff though, I wanted to do a bit of a rewind, and show you our Yalumba Rare & Fine night in Adelaide last week at Andre’s Cucina & Polenta Bar. It’s been open for nearly 12 months and hasn’t really been ‘discovered’ yet, so get in now whilst it’s easy to get a seat! The ‘Andre’ is Andre Ursini, finalist on the first Mastercgef program, and he’s followed his heart here and concentrated on producing Northern Italian share plates with homemade gnocchi and polenta as the stars of the show. It’s a nice sized hole in the wall eatery with a whole wall of banquette dining, on Frome Street in Adelaide – just next door to The Mantra Hotel. It’s got red umbrellas out the front on an otherwise colourless street – so you can’t miss it. Every piece of space is used – the shelves are all groaning with bags of rice and polenta, and overhead racks hold pots, pans, whole cheeses, salamis – all the ingredients for what’s on the plates are right there all around you! So from the top, this was our Yalumba Rare & Fine Dinner last Wednesday night June 22nd – everything sent out as share platters to long tables – and this is Andre – chef and owner – on the left, and his second chef Kane, on the right. They’re smiling because it was after the dinner, and all was good! 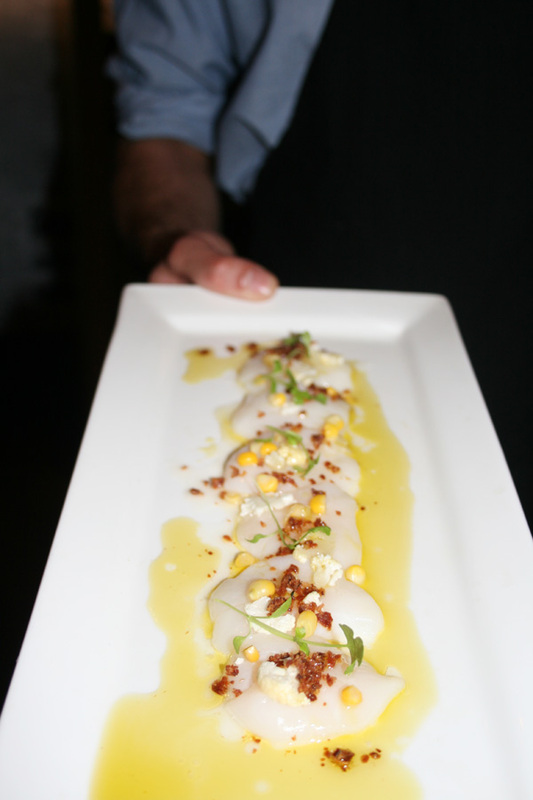 With the slippery and exotic 2008 Yalumba Virgilius (single vineyard barrel select) Viognier, we enjoyed the ‘Scallop Carpaccio – Esperance scallops dressed with cauliflower, corn, pancetta and extra virgin olive oil’. In the photo, the arm and hand holding the platter belongs to the lovely Rohan, one of Andre’s waiters, and he’s from the old school. Nothing is too much trouble, and he’s there with things almost before you need them! With the Cabernet Shiraz double of the new vintage 2009 Scribbler – bouncing red, black and blue berries over slightly smoky oak and more velvety fruit on the palate – and the 2006 The Signature – big dark brick of fruit aromas sitting on a solid base of more of the same – Andre sent out two dishes loaded with spot-on flavours and lighter textures to match! First the ‘Tagliolini Con All’ Anatra’, which is homemade thin egg noodle / fettucine pasta tossed with slow-cooked duck and pecorino cheese. But the flavours folks! 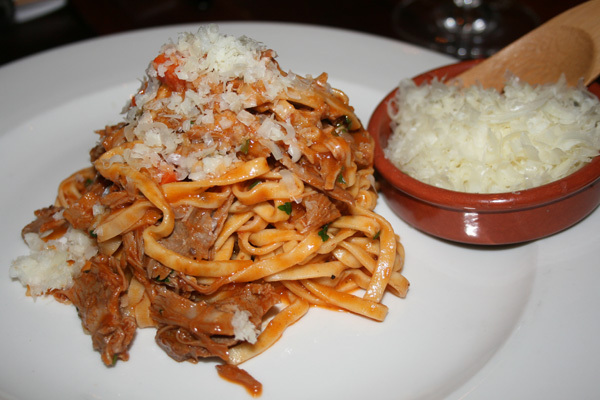 I wish I could do ‘scratch and sniff’ panels on this blog – the pasta, duck, and sauce combination tasted better than it looked! 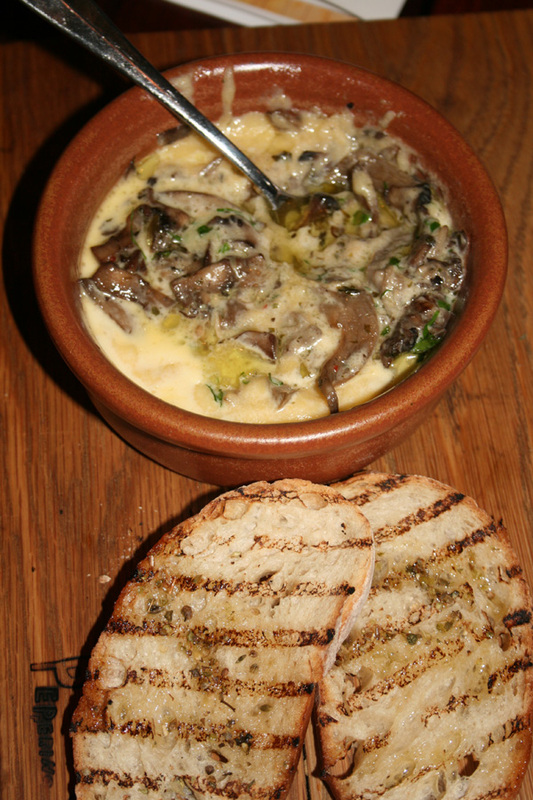 And it actually looks pretty good in my photo – I reckon I’m getting not too bad at this food photography thing! The second plate to come out was the ‘Gnocchi di Assisi’ – Andre’s own housemade gnocchi with tomato sauce, chilli, and Parmigiano Reggiano. Now I need to explain something before we go any further. Everyone who likes Italian style food has had gnocchi at one stage or another. And mostly, they’re pretty disappointing, because they’re gluggy and/or chewy. Sometimes you don’t mind so much, as the sauce is rich and compensates. But you’re always in search of that magic gnocchi moment – and it’s usually been in a home kitchen where they’ve been made that day and they’re fluffy. Well folks, Andre makes a certain number of srves of gnocchi every other day or so, and you need to ring ahead and reserve them. Why? Because he’s the Fluffy Gnocchi King as far as I’m concerned. They were memorable. Almost dissolving in your mouth, no chewing required. They had that ‘bloop’ thing going on as they went into your mouth – and you just know they’re going to be good! After that, I thought it couldn’t get much better, but with the 2007 Yalumba Menzies Coonawarra Cabernet – all mint eucalypt over cassis and a lean fruit and French oak palate – and the 2006 Yalumba Octavius Old Vine Shiraz – with its Christmas pudding cloves and cinnamon over sweet sticky fruit and mostly American ‘big oomph’ oak – Andre sent out another two winners. Look at this! On individual wooden boards was the ‘Bistecca’, 600g MSA Ribeye ‘Tagliata’ on the bone with salsa verde, and ‘La Polenta’ ,soft creamy polenta with Taleggio and truffled mixed mushrooms. And yes – they were great with the reds, and the aromatics of the four-way combination wine and food filled the place. As you can imagine, by now, this room was a pretty happy place. I know there’s a lot of drama going on in the world, but just for this one evening it was easy to forget all that and remember those great family dining times from yesterday, because this is what our dinner at Andre’s had started to feel like! Then there was only one thing left to be done. Let’s get you into the frame. Our wine was the Yalumba FSW (‘Fine Sweet White’) 8B Botrytis Viognier. Think honey, apricot and nougat on the nose, chased by more apricot, a lot of luscious, and a bit of grapefruit marmalade on the palate. 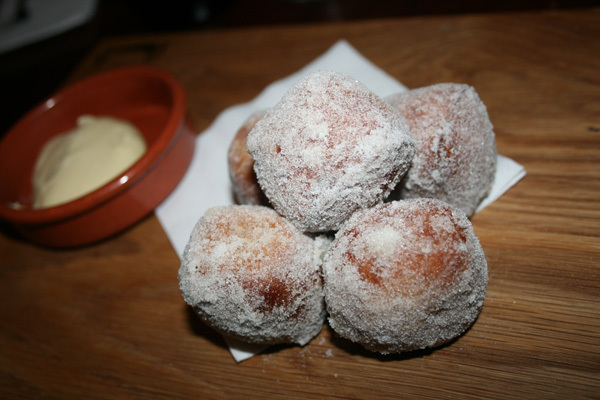 He did ‘Bombaloni’, banana and chocolate beignets with vanilla custard. What really happene,d though, was lighter-than-lamingtons banana doughnut sponge with a dollop of Nutella-like choc paste in the centre that was flowing by the time you bit into it! Not forgetting the sugar dust coating! What a lovely full stop to a magic night out. And someone must have had a word in Andre’s ear, because as soon as all the courses and wine chat were finished, they put on an Elvis greatest hits CD! Heaven on earth, folks, and like I said – get along before it gets too hard to get a seat! And don’t forget to ring ahead and reserve the gnocchi – they do NOT freeze them! PS I liked Andre’s so much that I was back there Friday with a couple of mates. We tried something from the specials board that we didn’t have the other night – see what you think . 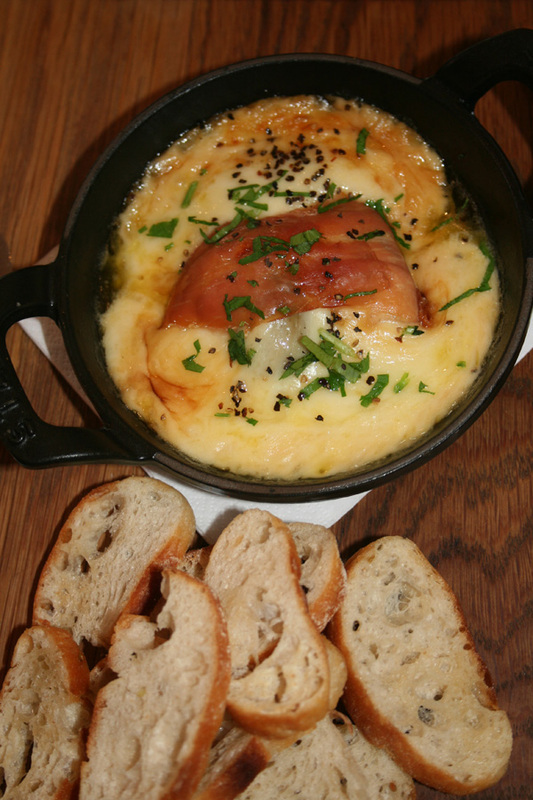 It’s called ‘Diavoletti’, smoked scamorza cheese baked with proscuitto and chilli-stuffed olives. And they change the specials board all the time, and have a stack of Italian and Australian wines by the glass – try the Heggies Botrytis Riesling with those Bombaloni – let me know if banana and citrus crosses over! OK – gotta go and get this bag packed for Perth. See ya when we’re in the West. Well folks, it’s been excellent working in Adelaide, and one thing is absolutely definite – I need to spend more time in my own backyard. The coffee is good – thanks Cibo Prospect – they’re my store, the food is great, and the company has been nothing short of special! 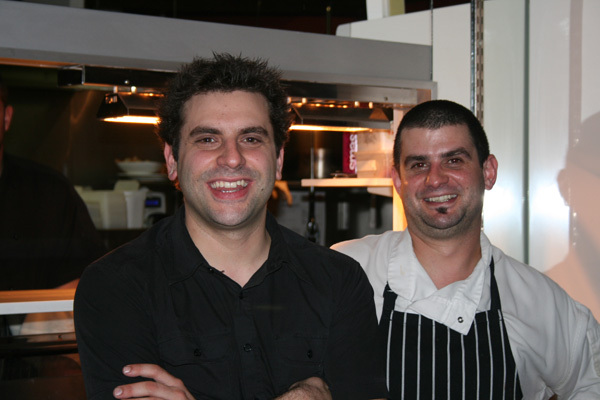 At Andre’s Cucina the other night I had the Italian boys who are the Australian amateur winemaking champs – Vinnie the Blade (is a butcher) and Sammy the Spade (is a builder) and they had much more than 20 questions about how we do what we do. Then there was Dimples the Real Estate King – you know who you are! – at the Saracen’s Head yesterday with some interesting crossovers with some of my top interstate customers, and Frankie the Home Builder and the Electrical Engineering brothers last night at Martin Palmer’s HWY. The level of interest from Adelaide at all of our events in what’s going on in the Yalumba Winemaking World has been intense, so thanks a huge amount to the City of Churches for coming out on three rainy nights, and to the Adelaide office for setting it all up. Thanks again Kate, Stevie, Therese, Sara, Dan, Daddsy and Big Pete – love to come back down anytime. And now … to the drycleaners, and out of one suitcase this weekend and into Big Blue for Monday’s aeroplane ride across the Nullarboar Plain to Perth for a week. Howdy folks, I should write up our sensational first Yalumba night at Andre’s Cucina in Frome Street – Adelaide City – but that’s going to have to wait just a tad longer. I want to put today’s lunch up first – for the girls! All of you who work in all parts of the business – outside, inside, technical, winemaking, viti, accounting, bottling, overseas in the Harpenden and Napa offices – this one today is for you! I can hardly call looking after today’s businessman’s lunch group ‘a job’. Picture this. A private dining room in the very sharp Saracen’s Head – in the business end of town. Inside the private dining room is me, our Yalumba sales leader in Adelaide, Pete Allert, and 13 – YES 13 – of THE most attractive business blokes in the city of Adelaide. I had a job keeping the presentation professional, because it is a huge distraction when a technical question is being asked by a boy who could quite easily be the romantic lead on half a dozen TV shows. But we got there! Have a look at this picture girls, and you tell me. On a day like today – it’s very easy to love the job! Just in case you were interested, the food that the Saracen’s kitchen put with the Rare & Fines was pretty solid. 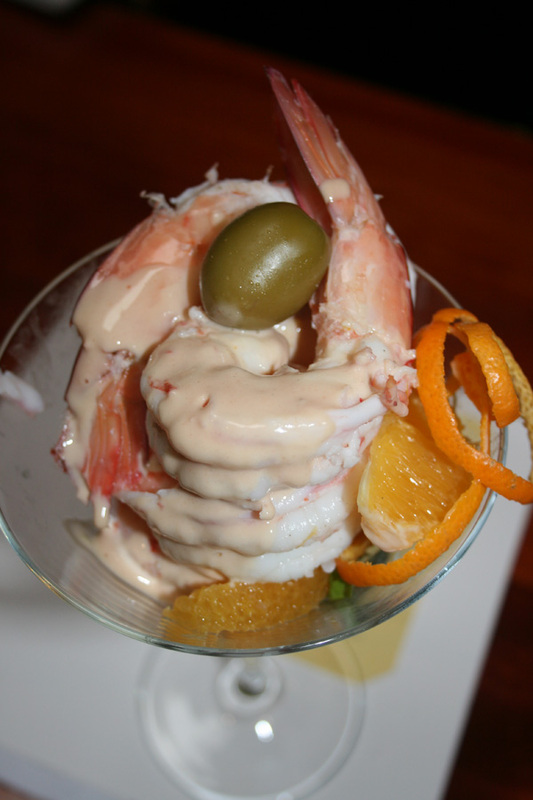 Firstly, according to them, the prawn cocktail isn’t having a comeback … it never went away! Here’s some very big swimmers with citrus, shaved greens and a mayo sauce in a proper martini glass – with the 2008 Virgilius Viognier. 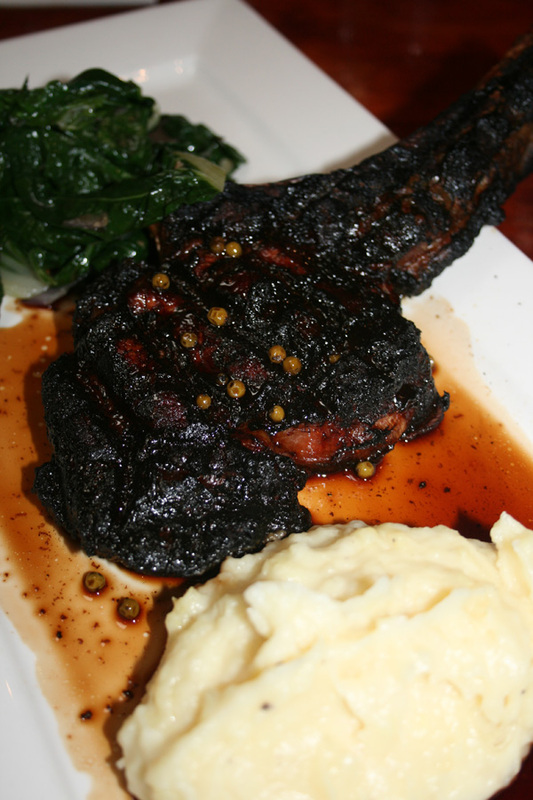 And for the 2006 Signature solid-wall-of-fruit-coffee-mocha Cabernet Shiraz – it was the big top ribeye, mine was ‘very well done’, and you have to love the spinach on the side – makes you feel good and healthy just looking at it. 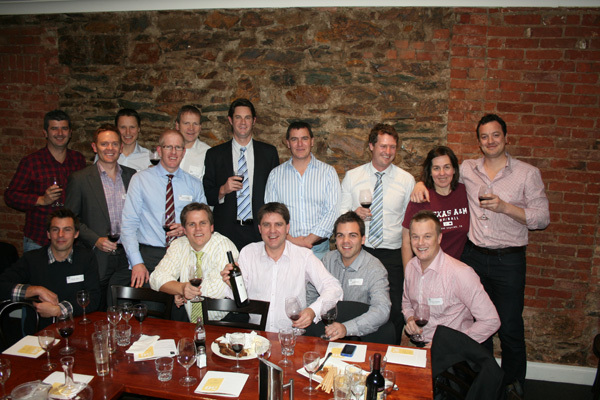 What a lovely way to introduce our top drops to the cream of the travel, banking, real estate and legal boys in town. If this is working … I’ll take more of it! Have to leave it there, as I’m off to the last dinner in this block of work – down at HWY. I’ll catch up Andre’s tomorrow because there’s the best kept secret in Adelaide right now – open just on 12 months and doing wonderful food things.